The Purlix Hedgehog stands for the company Purholz in Mittweida, Saxony. 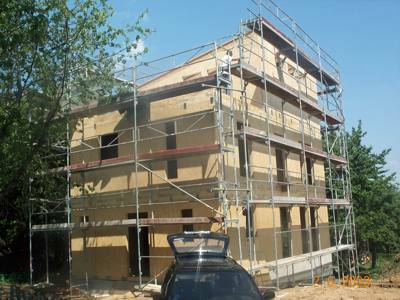 This company has developed the new constructing system Phonopur®plus. 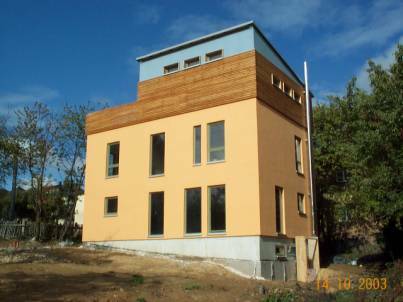 This off-site manufactured system combines thermal insulation, sound and fire protection, light diffusion and modular construction. 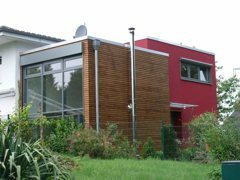 Since 2000 this method has been approved by the building authority and is becoming more and more popular also outside of Germany. It has also been noticed in the DTI Global Watch Mission (March 2004) Report/CIRIA “Modern methods of construction in Germany”. Inquiries and orders can be done per Internet, telephone or fax. Offers are implemented with a computer in our CAD-department and drawings for the production are made. 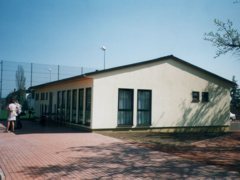 Because of the flexible modular dimensions the prefabricated composite panels can be combined in any way. Every order is individually checked befor the production begins. 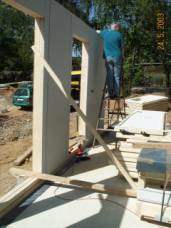 High precision during the production garantees an easy construction which saves time at the building site. With the help of any forwarder it is possible to transport Phonopur®plus even to rough terrains allover the world. The elements are assembled according to the mounting plan and arrive ready for construction at the building site. The first step is to layout and fix the sole runner. This actually is the longest lasting mounting step. It is imperative that it is absolutely level to enable an easy constuction of the Phonopur®plus panels. The sole runner parts are laid out and temporarily fixed. These are the stencils for the drillings. After the sole runner parts have been numbered they are removed and the holes can be drilled into the floor section. The drillings are cleaned and a dowel with integrated glue is set in. The Bitumenbahn is placed above these to protect the impregnated sole runner form dampness.The screws are set into the dowels through the predrilled sole runners. The screws break open the dowels filled with glue and are therefore additionally stuck to the floor section. Precise working is also required for this step. The elements have to be joined exactly like the erection schedule shows. This is necessary to avoid gaps between them. In addition to that a self-adhesive preformed gasket is placed on the lock-seaming joint, always starting in a corner. The next panel is set onto the sole runner and is pushed up to the previous one. After that they are screwed and nailed together with a perforated plate. One look into the erection schedule is enough to check the progress of the work. 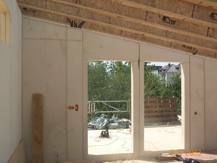 The window and door elements are made to fit exactly into the prefabricated openings and frames. This enables a fast and easy installation. At the end all the elements are screwed together. Every composite panel is reinforced with a mounting support before the floor ceiling is placed on. Now, the wall elements attached to the floor celining using a head runner. This is a type of ring anchor which affords a regular distribution of the weight. The floor ceiling can consist of different material, for example, TJI-beams. The assembly has to start from the front, if a first floor is planned. 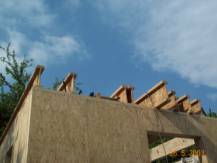 If not, then the rafters may be set directly onto the floor ceiling so that the roof or plank truss can be mounted. 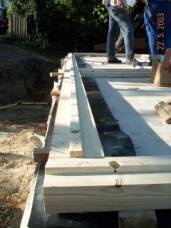 According to the construction of the ground floor the sole runner, dowels, glue and elements are mounted. One full size element of 1.25 meters width and 2.5 meters hight weighs about 90 kilos. This should be no problem for a team of 4 people. If requested, ductwork and in-wall sockets can previously be integrated into the composite panels. These would be worked into the installation chase between mineral woll and Fermacell surface (gypsum fibre plate). The attaching of the innerwalls starts with a wooden tongue. Then, one after the other, the innerwall elements are pushed together, aligned and screwed to each other. The Fermacell surface is good for fire protection and can be wallpapered or tiled right after the repointing and plugging in. No further precautions have to be taken for damp areas, like the bathroom. Even the do-it-yourself constructor has to consider safety at work and has to make sure an erection scaffold is set up if more that one floor is built. It can be pretty high! The structual work is finished and the facade can be applied. Thermal insulating material as well as wooden lining or clinker is possible. If you want a cellar or not is entirely up to you. 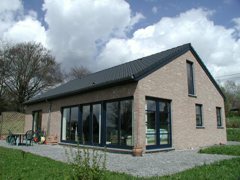 In any case the occupants can enjoy a pleasant warmth to their Phonopur®plus low-energy house! In this example with a fireplace and no central heating.The slim walls offer 10% more living space compared to any other systems. All used materials are licensed and are strictly examined by admitted independent institutes.It took 5 working days to construct a house with 2 ½ floors. All the helpers are enthusiastic and want to build their own house right now!